I want to share our family’s journey of adoption. I hope in doing this it will encourage others to consider children with unknowns and more involved special needs. When we received the referral for our daughter we knew she had a repaired heart condition called Tetralolgy of Fallot. We knew that she would require an additional surgery for valve replacement in her late teen years. This all seemed to be a very doable special need especially since we still have very young children in our home. Once home from China we took our daughter for her cardiologist check up. During the visit the doctor asked “Did I discuss with you DiGeorge syndrome when we reviewed her referral?” Our doctor had in fact discussed this syndrome because 20% of all children with Tetralolgy have DiGeorge. During review of her referral information he had asked us if she had seizures or immune problems. Luckily I knew the organization that fostered her and was able to ask them if she suffered from any of these conditions. They reassured us that she had never had a seizure and had only been in the hospital for heart surgery never for any illnesses. Fast forward back to her first cardiologist check up and our doctor suggested that we test our daughter for DiGeorge. Two weeks later her results came back positive. As any parent would be we were heartbroken. My husband handled it well and really had “it will be ok” attitude. I on the other hand was depressed. I couldn’t say the word DiGeorge with out breaking down in tears. I kept thinking and telling God “I am not this person, I can’t do this, this is not what I signed up for”. Let me stop here for a minute and tell you a little bit about this syndrome. It is a widely varied syndrome. Meaning it affects each child very differently. It is a genetic syndrome where the individual is missing part of their 22nd chromosome. It is also called 22qdeletion syndrome and Velocardiofacial syndrome. There is a long list of possible medical, physical, mental, and learning problems. No Hands But Ours has a link to read more about it if you are interested. After the diagnosis we had to visit numerous specialist – ophthalmologist, endocrinologist, cardiologist, ENT, audiologist, immunologist, renal ultrasound, cardiologist, orthopedic. I remember walking into each doctor’s office bracing myself for what they would tell me next. In regards to our daughter China had been right – our daughter did NOT have seizures and she her immune system was not depressed. She does have a palate problem called VPI that makes it difficult for her to say many consonants (this is something that cleft palate kids can also have). She has had surgery for this and has ongoing intensive speech therapy due to poor articulation. She has scoliosis. She also has bilateral conductive hearing loss due to ruptured eardrums. Currently she wears hearing aids and will have surgery in a few years to repair her eardrums and should regain most if not all of her hearing. And of course she has her repaired heart condition that will require a valve replacement in her early teens. There are still some unknowns in regards to possible learning problems, scoliosis treatment, and how and if she can live independently as an adult. Although, at this point she seems fully capable of living independently, but my husband is always telling her she can stay with us forever! Our daughter also is diagnosed with the biggest most loving heart you can imagine. Her spirit is gentle and sweet. She is a good learner and understood English quickly – while she had hearing loss (we didn’t know about the hearing loss till she had been home for 17 months). Currently she is developmentally on target for her age. Her only delay is expressive speech (articulation). She is also very cute. People gravitate to her and always tell me what an endearing child she is. I promise I am not just being “that mom”. I have a boatload of people who would back me up here! She is currently in a regular preschool doing great. She is learning her numbers and letters and most importantly learning that Jesus loves her. I have also learned a few things. I can parent a child with DiGeorge syndrome. Not only that, we love being her mom and dad. So often when you read the paperwork about a child you forget that there is a real child behind the photo and description. A real child that likes to dance, color, sing, and be a part of a family. A child that gets sad when others are sad and gets excited to go to the grocery with her dad. God knew that we would be too afraid to accept a referral for DiGeorge, therefore, he choose not reveal it to us prior to coming home. Thank goodness for that otherwise we would be without our precious treasure. Would we do it all over again knowing what we now know – Absolutely? Does that mean there aren’t hard times – NO! But through the hard and good times God is teaching our family about his love for all of us and these precious special needs children. He is revealing HIS heart to us in a way we could only know through this journey of special needs. 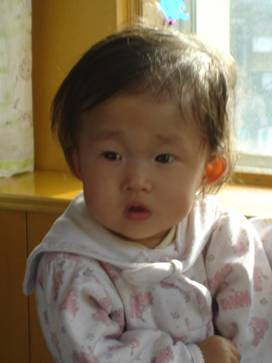 We are now in the midst of paperwork for our second China special needs adoption. If you have any questions please contact No HandsBut Ours at nohandsbutours@gmail.com. I have chosen to remain anonymous for many reasons but have given the owners of this website permission to give out my email if I can help you with this diagnosis or anything related. My daughter is 8 and has 22Q.